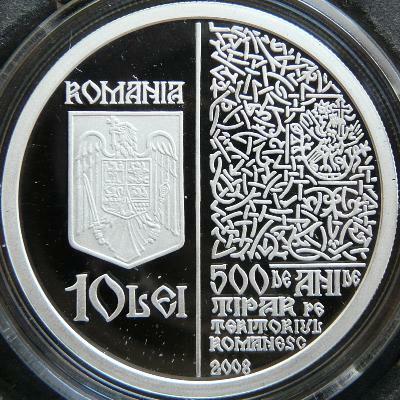 This coin was dedicated to the anniversary of 500 years from the first printed book in Walachia - the Litourgicon of Macarie. 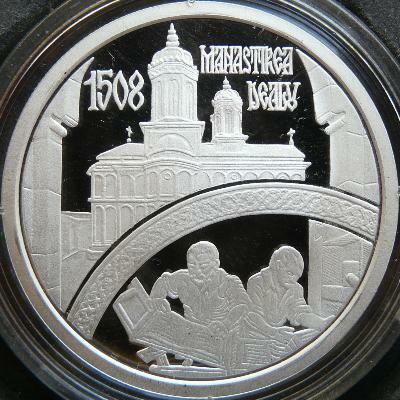 The Serbian monk Macarie served his apprenticeship at Venice, city with a very developed typographical industry at the end of the 15th century. He printed several books at Obod Monastery near Cetinje in Montenegro, in 1494-1495. 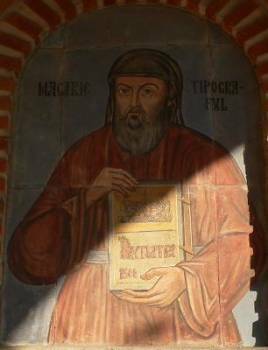 The hieromonach Macarie (hieromonach = monk who also serves as priest) was brought at Dealu Monastery by Radu the Great, ruler of Walachia (1495 - 1508). 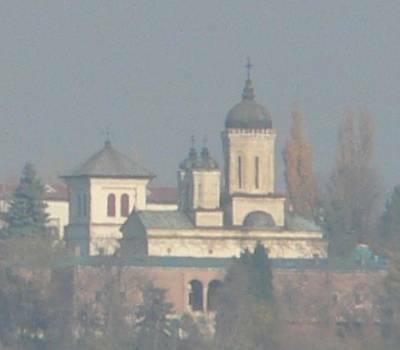 The monastery of Dealu was established by voivod Radu on a hill near Tîrgovişte in 1499-1501 ("deal" means "hill" in Romanian). In Walachia Macarie printed a Liturghier (a Litourgicon) in 1508, an Octoih (or Octoechos) in 1510, an Evangheliar (Evangelion, or Gospel Book) in 1512, all three written in Old Church Slavonic. The Liturghier is a book containing the Divine Liturgy and other divine services. The Octoih contains the texts to be chanted for every day of the week, successively for the eight tones or modes, and the Evangheliar is a book containing the four gospels. The Liturghier of 1508 has 256 pages of 15 rows of text. Only a few from the first books printed by Macarie survived until today, five of them being preserved in Romania. From the epilogue of the Liturghier we learn that "It was this book begun, called Liturghier, as ordained by ruler Io Radu voivod, for evermore be his remembrance, and was finished this book as ordained by the in Christ rightful believer and by God guarded and over illustrious ruler Io Mihnea, great voivod of all Ungro-Walachia's land and the parts at Danube, son of great Io voivod Vlad, in his first year of reign, straining himself also the humble monk and priest Macarie. In year 7016 (1508) [...] month November 10 days." In his "Istoria literaturii române vechi" (History of the old Romanian literature) Ştefan Ciobanu affirmed: "the vignettes, the first letters and the letter of Macarie's books are made after models taken from the old Slavonic manuscripts of Romanian origin". 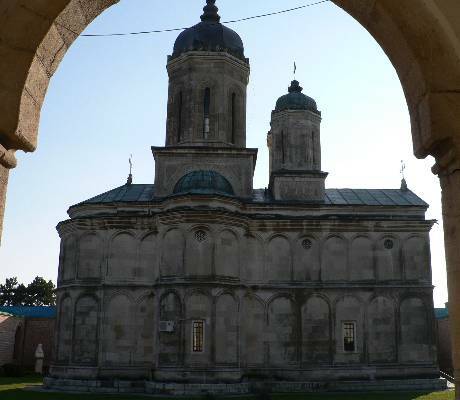 The Monastery of Dealu is very old, being mentioned for the first time in a document from 1431, when Alexandru Aldea, ruler of Walachia, gave a number of villages to the monastery. 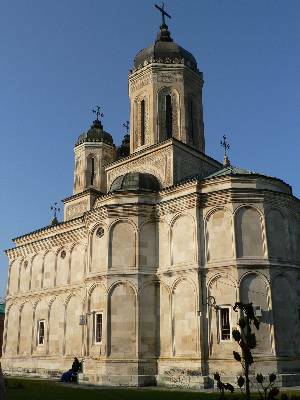 The church, dedicated to Saint Nicholas, was reconstructed in stone during the rules of Radu the Great and of his brother Vlad the Young, the painting being finished in 1515. 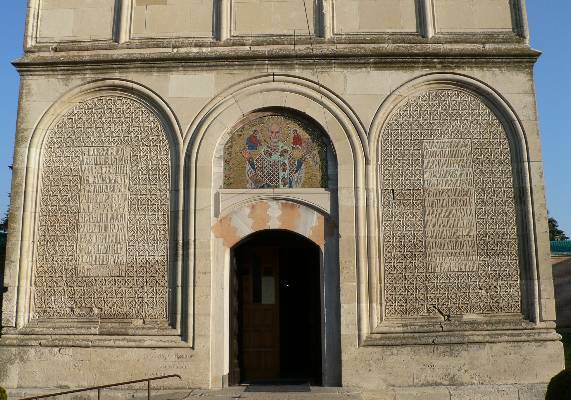 The monastery was repaired under Constantin Brâncoveanu and again during the rule of Gheorghe Bibescu, in the middle of the 19th century. Between 1912 and 1940 here functioned the military high school Nicolae Filipescu, where the former king Mihai of Romania learned for a period. The great earthquake of 1940 heavily damaged the buildings from Dealu. The towers of the church and the upper part of the belfry collapsed. Between 1953 and 1958, under the Patriarch Iustinian, the church was repaired, all other buildings being rebuilt from the foundations. Inside the church of many rulers of Walachia were burried. In 1603 Radu Buzescu brought here the head of Michael the Brave. The marble sarcohpagi of Radu the Great and Michael the Brave were carved by Fritz Stork, being finished in 1913. Today Dealu is a monastery of nuns.